Alkanes are widely distributed in the environment as they not only constitute the large fraction of crude oil but are also produced by many living organisms. They are saturated hydrocarbons of different sizes and structures, which pose a variety of challenges to degradative microorganisms due to their physicochemical properties, i.e., the extremely limited solubility and the high energy required for activation. 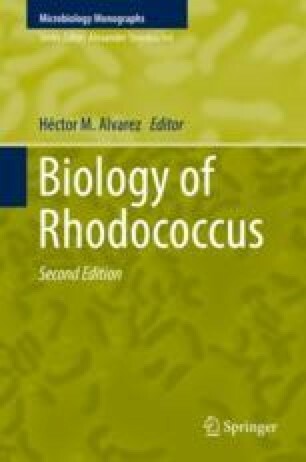 The hydrophobic cell surface of Rhodococcus spp., the ability to produce biosurfactants, and the possession of a wide range of oxygenases allow coping with such challenges. In particular, monooxygenase enzymes are involved in the activation of alkanes by converting them into alcohols, which undergo a series of oxidation steps before being converted to fatty acids. Rhodococcus alkane monooxygenases belong to different families (i.e., AlkB-like monooxygenase, soluble di-iron monooxygenase, cytochrome P450), have different genetic organization, and are subject to different regulatory mechanisms, which are poorly known. Because of their long-term survival capacity, broad catabolic abilities, and effective contact mechanisms with hydrocarbon molecules, alkanotrophic Rhodococcus strains have biotechnology applications and potential in bioremediation and biotransformation reactions.